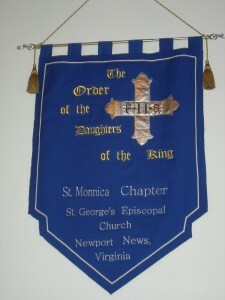 Founded in 1885, the Daughters of the King is an Order for women who are communicants of the Episcopal Church, churches in communion with the Episcopal Church, or churches who are in the Historic Episcopate under a rule of Life, incorporating the Rule of Prayer and the Rule of Service. By reaffirming the promises made at Confirmation, a Daughter pledges herself to a life-long program of prayer, service, and evangelism: dedicated to the spread of Christ’s Kingdom and the strengthening of the spiritual life of her church. The St. Monnica Chapter was formed in 1990 and meets the 2nd and 4th Tuesday of the month for study and prayer. Prospective members undertake a 3 month study to discern if they are interested in becoming Daughters. New members are welcome.